The skills required for success in any job are always being upgraded, and new hire employment assessment tests could take some of the guesswork out of deciding who is the best candidate for the job. What are New Hire Employment Assessment Tests? New hire employment assessment tests come in many forms, but they all test for different skills and fit factors in the candidates you interview. Standardized and solid in their design (not pseudoscience or a Facebook personality test). Test for traits and competencies essential to the role for which you’re hiring. Why are New Hire Employment Assessment Tests Used by Companies? New hire assessment tests are used by companies as a screening tool to reveal specific candidate fit data in a standardized, results-driven format. Proficiency with tools essential to the role. Knowledge that is essential to the role. General cognitive ability levels and learning speed. Personality traits essential to the role. Each type of new hire assessment test is designed to reveal different aspects of a candidate’s fit for a specific job or for general fit to work at your company. Skill assessment tests are used to gauge candidates’ competency using specific skills. Whether testing for a hard skill like coding or soft skills like creativity, skill assessment tests require candidates to use a skill and measure their competency using that skill. However, insights taken from skill assessment tests can be limited or incomplete. And specifically it leaves room for question as to whether the candidates can execute on said skills. The best way to supplement and truly measure a candidate’s skill set in action is to ask people who have worked with the candidate previously. Checkster’s automated reference checks ask customizable questions to gauge a candidate’s fit including proficiency in particular skills. Checkster even provides intuitive reports that show average scores on skills and other factors that will provide easy comparison points and make choosing the best-fit candidate a breeze. Knowledge tests are used to evaluate specific and general knowledge that a candidate will need to be successful if they are hired for your open job. Just be sure to test for their ability to actually apply the knowledge for which you’re testing , as both skill ability and knowledge will be required for success in the role. It’s important to note that references can also give input on a candidate’s previous accomplishments and abilities. This method will give you much more in-depth information into how an employee is actually going to perform once in the role. Consider digitizing your reference checks and get back this type of knowledge-base data in just two days. Personality tests are used to create a personality profile of candidates applying to your company and to reveal personality traits that are advantageous or problematic for success in the role. When using a personality test, try to avoid interpreting the results as standalone data. Rather, evaluate the results along with other interview discovery such as your personal conversations with the candidate, hiring manager feedback, reference input and more.. Finally, be sure that you are using a reputable test, as many personality tests are not accurate predictors of success. Cognitive or aptitude tests are designed to measure general cognitive ability and aptitude. Instead of considering a single skill, these tests measure general cognitive ability in a specific skill set or across a range of skill sets. As long as these tests are based on a sound scientific design, they can be great predictors of success in a role and a candidate’s general abilities. Ethics or integrity tests are designed to reveal how ethical candidates are and how they think about ethical issues, complex and simple alike. Ethics/integrity tests are often most effective when combined with other tests, as an assessment clearly labeled “Ethics Test” gives dishonest candidates their cue to being strategically careful when supplying their answers. Luckily, Checkster automatically checks for candidate honesty during the reference check process, using a proprietary algorithm. Now that you’ve seen some examples of different assessment tests, you can use this information to try and create your own tests to measure the skills and knowledge of applicants to your next open job. An important note: you should not try to create a personality or cognitive test. Reputable personality and cognitive ability tests are created by scientists and use mountains of data to accurately measure personality and cognitive ability. These types of tests can effectively reveal desired and undesirable candidate traits to help you make a better fit decision for the role you’re trying to fill. However, in order to avoid bias, inconsistencies, or worse, unintended discrimination, do not create your own -- be sure to only use personality and cognitive ability tests verified by I/O psychologists. .
To create a knowledge assessment test, begin by clearly defining the knowledge you are testing and creating a set of requirements to evaluate the scope of a candidate’s knowledge. Let’s use a sales position as an example. The process by which sales are generally made, the steps in this process and best practices in each stage of the sales process for moving a lead toward converting into a sale. The tools that are used by sales to manage lead information, communications and sales. The sales principles that are most applicable to moving the sales process forward given the requirements/desires of a lead, the stage of the sales process and other relevant factors. Before contacting a lead, what lead information is the most important to review and why? When is the best time in the sales process to tell a lead the price of what you’re selling? When a lead has expressed interest in the product you’re selling, but keeps saying “they need more time,” how do you keep them engaged without making them feel pestered? When a lead says they are unable to buy right now, how do you use your CRM to ensure that you follow up when the lead is ready to buy? When a lead’s status or position in your sales process falls outside of the sales process stages set up in your CRM, how do you keep track of this lead’s needs and drive them toward conversion? How would you ensure that the leads you contact are not contacted by other sales reps using your CRM? When is the right time to discuss price in your sales pitch? Is there a right time? How would you convince a lead who is evaluating our competitors that our company is the right choice for their needs, without being pushy? To create a skill assessment test, start with the skills you are testing for, define the way that these skills will be measured, and create a set of performance standards related to actual performance requirements for the job. Lets use an email marketing role as an example. Creating email campaigns using an email marketing program that utilizes behavior-specific alternate emails and email chains to drive conversions. Write an introductory email for our accounting services company that communicates the advantages of using our company and includes a link to our services overview page. Then, write behavior-based follow up emails for the following outcomes: the recipient opened the email, the recipient opened and clicked the link our services overview or the recipient did not open the email. But there’s an even better way to find out if a candidate will be good in a sales or marketing role... Ask past coworkers and managers! After all, they have direct experience with your candidate and can speak to specific successes or failures. Even if you conduct a knowledge test as above, be sure to incorporate reference feedback to supplement your data. Perhaps the sales candidate answered all the questions on your test correctly, but what if their previous manager tells you they have motivational issues and missed their quota target for the last three quarters? Maybe the Marketing candidate writes well, but has no experience creating the very specific, targeted campaigns you will need to be successful. Check their references. 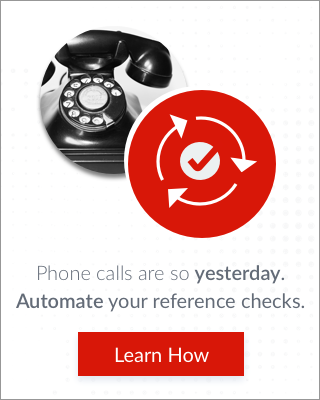 But don’t waste any time on the phone getting this information, just sign up with Checkster and automate your references. With 2 minutes of effort, you will see an average of 6 references giving detailed, candid feedback about your candidate that will give you data on most of these more in-depth questions you need answered.. When evaluating assessment tests, be sure that all tests are being evaluated fairly and against a standardized set of criteria. Ensure all assessments are evaluated against the same set of criteria. Ensure all assessments are evaluated using the same methodology and that everyone involved understands both the test answer criteria and the importance of objectivity in this process. Ensure that anyone scoring assessment tests is free from professional bias (thinking there’s only 1 right solution to every problem) and discriminatory bias (thinking there’s only 1 right type of person for the job). Use the results of assessment tests to make objective, evidence-based hiring decisions while still taking each candidate’s credentials and their performance in interviews into account. It’s challenging at times to know whether you’re making the smartest hiring decisions. As a result, it can be tempting to employ new hire tests to confirm hiring decisions on candidates. However, use caution when gathering data from these tests and using it to compare candidates. First, make certain you are aware of all the laws around what questions you can ask and how to keep bias, or even unintentional discrimination, out of your hiring process. Second, it’s important to take into account information and input from various sources, and to not allow the results of the test alone to bias a decision. For example, how do you know the employee was honest when they took the test? Or what if they got a perfect score and understand the principles but are unable to apply them effectively in the real world? Checking references digitally, and gathering good reference feedback at that, will shed light onto the true skills and fit criteria of a candidate that might otherwise be missed. In order to make the smartest decisions, make certain to incorporate detailed reference feedback into any hiring process.